Your Mac is not charging? Here’s how to fix it. A beauty of a MacBook or any other laptop is its portability. You can unplug it and use whenever and wherever you want. Of course, it only makes sense if it holds the charge. That’s why it can be a nightmare when your laptop is not charging hence killing its portability factor. In this article, we’ll walk you through the step-by-step process to fix your MacBook that’s not charging. But before we start, let’s look at a few possible reasons why your laptop battery won’t charge. Why my Mac won't charge? Here are 5 ways to fix your MacBook, MacBook Air or MacBook Pro not charging. Before you look any further, you need to check the basics. If your MacBook Pro battery is not charging, verify the power cable. Inspect every inch of the cable and look for broken spots or any dark stains on its surface. If you find any damage, there is a chance it’s causing the problem. The next thing you should do is to verify the ports for any foreign objects or debris. Dust can build up in the charging port blocking the connection, so if you find something, use a wooden object to remove it (you can use a toothpick). Check whether you are plugged in into the wall socket. Make sure it is turned on or try using a different socket. We know this sounds a bit basic but it’s always better to double check. To prevent electric shock and other dangerous accidents, be careful when working with wiring and power tools. Never leave electrical appliances somewhere they can easily fall into the water. Always be cautious for your own safety. Just like apps on your MacBook can get frozen, so can the hardware that controls the charging of your notebook. That’s why when your MacBook won’t charge, try to restart it. A simple reboot can reset the hardware and fix the problem. Click on Apple logo in top left corner of your screen. Wait for the reboot and then try charging your Mac again. The MacBook battery may wear out faster than expected if you use it intensively. You should always monitor its status; otherwise, there’s a risk of having a non-working notebook at the most inappropriate time. Checking your battery health is especially relevant when the battery doesn’t charge even with a cable. Normal — Your battery is functioning well. Replace Soon — The battery works fine but holds the charge less than it did before. It should be replaced soon. Replace Now — You should replace the battery as soon as possible as it keeps the charge very bad. Service Battery — Your battery has to be replaced immediately to prevent damaging your MacBook. Can certain apps affect battery health? In short, the answer is yes. According to security researcher, Charlie Miller, “malicious software may be exploited in various ways, from just causing the battery to stop functioning to auto-installing malware.” The "backdoor" applications may disguise themselves as alerts to “update your Flash player” or imitate harmless Chrome extensions. If you are unsure about downloading such things in the past, you need to run an anti-malware check. Chances are, your battery will come to life. Many users on Apple forums recommend using CleanMyMac X as it deals with macOS-specific viruses. This app developed by MacPaw is notarized by Apple, so you are safe downloading it. Here is the link to get a free edition. When you run CleanMyMac X, click the Malware Removal tab. This should reveal if any app has highjacked your battery. The System Management Controller (SMC) is responsible for the battery management and its status indicator lights. Therefore, if your Mac battery is not charging, resetting the SMC may help. Note that the process of resetting the SMC for MacBooks with a removable battery and a non-removable battery is quite different. That’s why first you have to determine whether your battery is removable. Mac notebooks that have non-removable batteries include MacBook Pro (early 2009 and later), all models of MacBook Air, and MacBook (late 2009). Press Shift-Control-Option and a power button at the same time and hold for 10 seconds. It may be surprising but the reason of your MacBook battery not charging may be as simple as overheating. If the thermal sensors within your laptop detect a drastic rise in temperature, they block out the access to the battery as a safety measure. What can you do if your MacBook is hot to the touch? 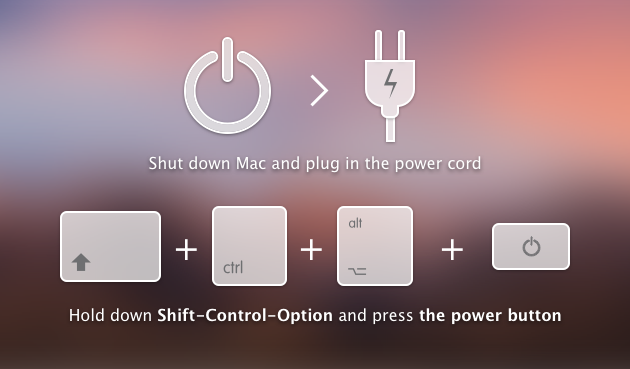 Simply turn it off and let it be for some time, or place a fan near your Mac to cool it down right away. If you work outside, move into the shade — direct sunlight can cause your Mac getting hot. Another issue is battery-draining apps. It has been noted that some programs are extremely taxing on battery. There’s a simple way to check it using the tool we’ve mentioned above, CleanMyMac X. It has a system health monitor in the upper bar of your Mac. When you click on it, you will see the apps that drain your battery far too much. You may need this tool to do further maintenance on your Mac. Download it here, from the official site. If all troubleshooting methods fail, consider taking your MacBook to the Apple Store or a certified Apple repair center. Every laptop has its own quirks, and at this point, it’s better to ask a licensed professional to help. 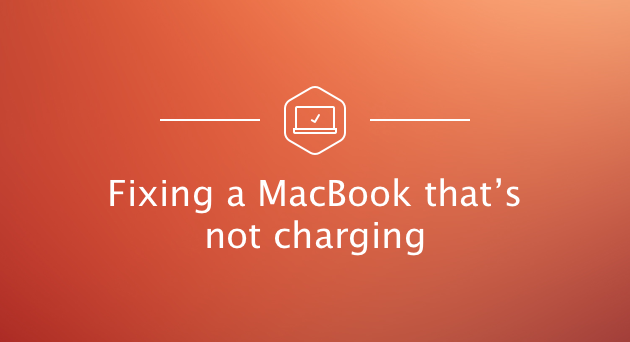 More than likely, your MacBook will need a unique fix. 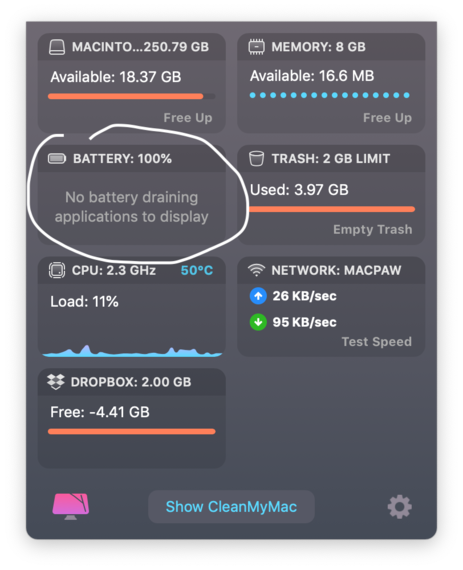 To avoid those unpleasant “Why won’t my laptop charge?” surprise, also check our comprehensive guide on “How to increase Mac battery life.” Take care of your battery health! How to remove spyware on Mac?